The University of Montana Dance Program will launch its 2018-19 season with “UM Dancers on Location,” a site-specific dance concert at noon on both Saturday and Sunday, Sept. 29-30. The free outdoor concerts begin at UM’s Mansfield Library Mall and unfold as the audience travels – via foot, bike, stroller or skateboard – to different venues on and around campus to behold diverse dance and performance-art installations. “UM Dancers on Location” invites the audience to celebrate the gems of UM’s beautiful campus through the eyes of a choreographer and the movement of dancers. Almost every fall, the Dance Program brings innovative new pieces of choreography out of the theatres and studios and into nature. After a year’s hiatus due to last summer’s hazardous air quality, the School of Theatre & Dance is pleased to present this popular production once again. “For over 50 years, site dances have captured the attention and imagination of unassuming audiences, who are often caught by surprise as dancers perform in nontraditional venues and locations,” said UM dance Professor Nicole Bradley Browning. “Site dance makers are inspired by the architecture, natural design, function and symbolism of the space. “In this whimsical and meaningful performance, dancers have the opportunity to draw attention to, transform and expand upon our understanding of place,” she said. 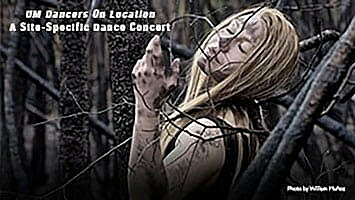 No tickets are required for “UM Dancers on Location.” Audience members simply gather in front of the Mansfield Library at noon. Follow this link for more information.